List of muslim players in Premier League – English Premier League (EPL) is the most popular and most-watched football league in the world. It attracts many players around the world, including muslim players. The fact is there are many muslim football players in Premier League this season. They are not only join mid-table or mediocre team, but there are several EPL muslim players in big clubs too. We will discuss full list of muslim players in Premier League 2017-2018. Throughtout its history, there are several muslim players in England that compete in Premier League. Notable example of Premier League muslim players in the past are Nicolas Anelka, Kolo Toure, Salomon Kalou, Emmanuel Adebayor and many others. They are gain fame and success, for example Anelka is one-time EPL top scorers, while Kolo Toure is key part of Arsenal’s Invicible team. Of course there are flop muslim players too, such as Ousmane Assaidi, Samed Yesil, Baba Rahman or Marouane Chamakh. But the fact that there are many muslim players in EPL that gain success can’t be overlooked. Currently there are more than 50 muslim players in EPL. One of them, N’Golo Kante, awarded Best Player in Premier League in season 2016-2017 ago. Other players also become key player for respective teams, For example Paul Pogba, Manchester United midfielder who broke record for most expensive players in 2016. Than there is Mohamed Salah, Liverpool muslim players and currenly the frontrunner for Premier League top scorers award. One of the most popular muslim players in Europe is Mesut Ozil, currently at Arsenal, known by his tradition to pray before match started. Other notable example are Moussa Dembele (Tottenham), Sadio Mane (Liverpool), Ilkay Gundogan (Manchester City), Xherdan Shaqiri (Stoke City), Granit Xhaka (Arsenal) and Marouane Fellaini (Manchester United). Here are complete list of muslim football players name in each of Premier League clubs 2017-2018 alphabetically and his country origin. Currently, there are more than 50 muslim players in English Premier League. 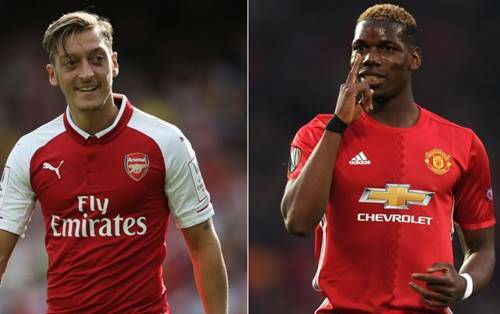 Those list also including some world-class players such as Paul Pogba, Mohamed Salah, N’Golo Kante, Ilkay Gundogan, Riyad Mahrez, Sadio Mane, Emre Can, Mesut Ozil and Granit Xhaka.